Windows 95 is still the most beloved iteration of Microsoft's operating system, and you can now relive those halcyon days on any modern macOS, Windows or Linux computer by downloading it as an app. 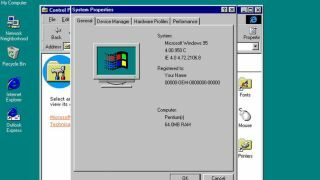 Windows 95 v1.0, as it's known, was created by developer Felix Riesenberg, and is free to download from GitHub. Granting a 13-year-old operating system free rein over your computer would be a security nightmare, so the app runs safely sandboxed with no access to networks or files stored on your device. Sadly that means you'll miss out on the classic Internet Explorer experience, but that's a small price to pay to keep your rose-tinted glasses intact. You can while away the hours with Freecell and Solitaire, create a pixelated masterpiece in the classic Microsoft Paint, and compose missives in Notepad - all accessible via a good, old-fashioned Start menu. There'll be no interference from Cortana ether, though you might miss her when Clippy starts chipping in.